Prime Minister John Key’s gift for Her Majesty, The Queen is a brooch created from a blue pearl provided by Christchurch-based company Eyris Blue Pearls. It is called ‘Aotearoa’s Pearl’. It is with pleasure, that we present ‘Tangaroa’s Creation’. 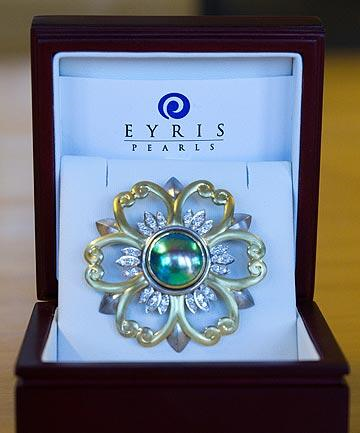 A beautiful 15mm Gem grade Eyris pearl in green blue colouring, has been perfectly set in 18ct yellow gold, handcrafted by Jacek Pawlowski of the Blue Pearl Gallery in Akaroa. The setting has been partnered with a 3mm, 18ct yellow gold flat Omega necklace. Retirement Chest - Constructed sterling silver, 18ct gold, Pacific Blue 7mm C grade blue pearls. The Koru Pearl pendant was handcrafted by Blue Pearls Gallery. Eyris Pearls and Blue Pearls Gallery have gifted this pendant to Karla to be auctioned off at the Miss World competition in USA, December 2016 to help raise money for the Childrens Charity Auction - Beauty with a Purpose, Helping Children Worldwide.